“Dirty Linen” (click on “Essays and Reviews” on the panel at the top of this page) is something I wrote several years back and then updated for publication in Ecelectica (where all the essays on this blog, so far, were originally published). It’s the longest and most ambitious essay I’ve written. Sadly, it still seems relevant, and that’s why I’m including it here halfway through Black History month. The idea for the piece was originally generated out of the O.J. Simpson trial, but that was just the launching point for my thoughts and feelings on the subject. I think it’s difficult to gain a perspective, any real objectivity, on a phenomenon as deeply embedded in our social fabric as is “race” (you’ll understand why I insist on the quotation marks if you read the essay). It’s like trying to examine the back of your own head. I made an attempt to do so in this piece not because I am any more free of this social pathogen than anyone else but because the subject has preoccupied me for as long as I can remember. Writing is largely a matter of exorcising old demons and realizing what frequently lies below the level of consciousness. If you’re lucky, you find readers who share your possessions and enjoy or at least are willing to suffer through the birthing of those realizations. Hopefully, that will be you. It’s already one of the most banned books in the United States. Why bother to ban it all over again? These days it’s mostly the “N” word that gets the book taken off school library shelves. There are still plenty of people, mostly of the older generation, for whom that word is so fraught that they don’t want to see or hear it used under any circumstances, even in a work of literature. Perhaps in past days the reason Huckleberry Finn was kept from the impressionable minds of the young had more to do with its presenting the South in an unfavorable light. But my contention after four readings of the book is that it should be banned now, right now, because it contains downright seditious material. It should be prohibited on at least two grounds: First, the book is unpatriotic, is in fact anti-American. Second, it is immoral. In fact it goes right to the heart of the bedrock of our morality and makes of it a mockery. I’ll address the second offense first. I’m referring, of course to the episode in one of the small towns along the Mississippi that Huck visits. A local storekeeper is being harassed by a fellow townsmen who stands outside his store and holds him up to scorn. The shopkeeper warns the man that if he doesn’t desist he will be shot dead. The harasser does not desist, and the shopkeeper shoots him, much to the delight of the other townspeople, who seem to enjoy a good killing to break up the monotony. The scene then shifts to the shopkeeper’s home outside of which an old-fashioned lynch mob has gathered (both these scenes could have been lifted out of a Hollywood Western, no doubt inspired those Westerns, however indirectly). The shopkeeper, a man of few words who means what he says, appears on his porch with a gun and challenges the crowd to do what they have come for. He not only challenges, he ridicules, telling them that one or two of their number are “half a man,” but the rest are no better than an “army” which — and here comes the sedition — is no better than a “mob of cowards“! But my first reason for banning the book is even more serious. The incident with the shopkeeper could possibly be written off, with some expert academic help, as not really the author’s opinion but only that of the character. But Huck Finn’s long wrestle with his conscience about allowing Jim the slave to go free, to aid and abet him in the quest for that freedom, occupies much too great a part of the book not to question the author’s intent. 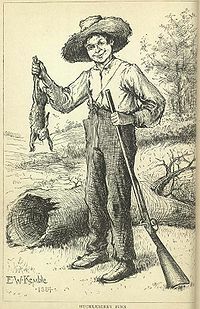 When, despite knowing it is not only criminal but morally wrong to deprive someone of their property, in this case their human property, Huck Finn does so anyway, accepting the fact of his guilt, even of his condemnation to hellfire, as a consequence, he makes it clear he has done exactly what his conscience told him not to do. What’s a conscience for if not to guide us toward good and away from evil? Do we really want to give our young people the message that conscience is only a repository for whatever society accepts as right or wrong at that particular moment? If so, are we prepared to take the consequences? I say it isn’t worth the risk. Therefore, I submit Huckleberry Finn should be removed from all public and academic library shelves, with the exception of special permission to be granted for its perusal by accredited and approved scholars whose intent is the study of seditious literature for the purpose of protecting society from its corrosive effects. I hope you will write your congressperson to urge him or her to pass appropriate legislation without delay. I just finished rereading Virginia Woolf’s A Room of One’s Own. Is there a better piece of nonfiction prose in the English language? Although, what it most reminds me of is the craftsmanship of Plato’s Apology (she knew Greek and Latin). I was a mediocre student of Greek. I rarely completed any of the assignments. But, for reasons I won’t go into here, I did do justice to the Apology, and have been grateful I did ever since. I don’t have much use for Plato’s philosophy. It seems to me to have been the root of most mischief in the Western world, or at least provided the rationalization for that mischief. But, by God, the man could write. The other comparison that comes to mind, of course, is Montaigne. There is the same leisurely presentation, a meandering approach which reveals the process of creation as it happens rather than presenting us with elegant Ciceronian argument. But, it’s one thing to read a great writer like Montaigne in translation and quite another to experience Woolf’s achievement in one’s own language. And I haven’t even mentioned the subject of the book. I have followed the feminist movement from my mother’s knee, you could say. She came to adulthood at the ripening point of the women’s suffrage movement in the early part of the 20th century. I don’t know how conscious she was of that movement, but like every woman alive at that time she must have been profoundly influenced by it. Hers was the first generation to “bob” their hair, and she once told me her own mother never came to breakfast without first putting on her corset. My mother’s honeymoon portrait, taken in the late 1920s, is very much that of a “liberated” woman. Her short dress was as flimsy as a slip, and the saucy expression on her face is as different from that of women in wedding portraits of the previous generation as anyone could imagine. I was exposed to the residue of that early 20th-century feminism through for her several years before the feminist movement of the late 1960s and 1970s. I am not well read in the subject. Even so, I find it hard to imagine anyone putting the case better than it appears in A Room of One’ s Own. Woolf was writing almost a decade after British women had achieved the franchise. There must have been the same sense of generational difference between women her own age and those in her audience as we observe nowadays between women who remember when our society was not just de facto but institutionally anti-woman and the younger generations who can take for granted the rights won by their elders. Even so, in 1928 the gains, however momentous, were still precarious. A woman needed financial independence more than anything else. 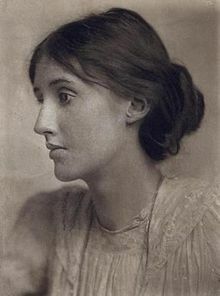 Woolf categorically states that between receiving the franchise and receiving notice that she had inherited 500 pounds a year for life, she still considered the latter to be clearly of more importance. Hence, the title and the necessity for a room of one’s own, with a lock, which implies the financial wherewithal to pay rent as well as to pay for the other necessities of life. But, as I say, the essay is not an argument, and is even less a polemic. It’s what today we call a personal essay. It’s even cast in a semi-fictional form, which is to say she warns the audience she is going to treat the material in a narrative form that does not strictly adhere to facts, at least not facts as a court of law might see them. But the “fiction” is more along the line of journalistic license rather than fabrication. I have no doubt she really did visit the British Museum and try to read that big stack of books about women, all written by men, or that she really was chased off the lawn by the beadle at “Oxbridge.” In fact, she could never have achieved the impact one feels in reading this essay if she had not experienced what she narrates or had used any other form to express it. She was too much of an artist to proceed in any other fashion. If I were in charge of any kind of higher-education curriculum, I would insist this book be part of it. It belongs there certainly as a literary achievement, but there is so much more to it. And I find it hard to imagine a better starting, or ending, place than this for any study of feminism. I only wish my mother had lived long enough for us to share it together. So, who is not loving the cello? My father is who… Actually, the father of the narrator of this story, originally published in Eclectica and included in my collection The Jew’s Wife & Other Stories (as in, You don’t have to be Jewish to…). Click on the “Short Stories” link on the panel at the top of this page and then on the story title to read it. And…zei gezunt! I know it’s Superbowl XLVI. This is a piece I wrote a few years back, but it’s still a propos (click on Essays & Reviews, above, to read it). Angst never goes out of style. Neither does religion and patriotism, which is what this essay is about if I read it correctly (after you’ve finished writing something, you’re just another reader, and not the best one, either).